A vertebral compression fracture refers to the collapse of a vertebral body (building block of the spinal column. Compression fractures are a leading cause of pain and disability in the United States, especially in patients over 65 years old. Most commonly, these fractures occur due to osteoporosis (soft bone) or trauma (fall, lifting/twisting injury, or sometimes a bad coughing fit). Occasionally, these fractures can occur without any trauma or injury in the presence of cancer or infection. How do we diagnose a Vertebral Compression Fracture? Usually, vertebral compression fractures can be diagnosed and followed with plain x-rays of the spine alone. X-rays are quick, non-invasive, and use little radiation. Computed tomography, or CT scans, can be used to diagnose vertebral compression fractures. CT scanners use a series of x-rays and powerful computers to create 2 and 3-dimensional images of the spine. Additionally, CT provides further information about the soft tissues and organs surrounding the spine. Magnetic resonance imaging, or MRI, is another powerful tool for diagnosing vertebral compression fractures. MRI uses a powerful magnetic field to produce detailed images of the spine. MRI does not produce radiation and is not associated with radiation risks. 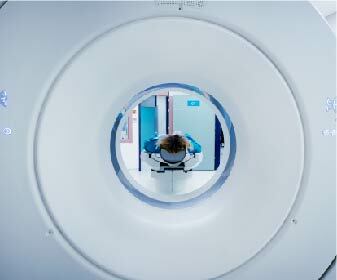 MRI can also give information about the age of the fracture and the health of the nerve roots exiting the spine. A bone scan is a special type of study in which a small quantity of a radiotracer is injected into the patient’s bloodstream and allowed to be absorbed the bones and other organs. Healing vertebral fractures absorb a greater amount of the radiotracer than normal bone, which can be used to identify which fractures are causing a patient pain. How do we treat a Vertebral Compression Fracture? Vertebroplasty is a minimally invasive procedure in which small incisions are made in the patient’s back under x-ray guidance and a special cement is injected in a collapsed vertebra to prevent further collapse. Kyphoplasty is a similar procedure in which the radiologist uses special tools to restore some of the lost height to the collapsed vertebra as the cement is injected. These procedures can provide significant pain relief without surgery for patients with compression fractures.